Call me literal, or not a fan of hyperbole, but I believe that calling, in effect, otherwise well-intended marketers “sinners”, and setting the bar too high (95% of claims found this year were found to commit one “sin” or another), is misleading the public—and the press— into thinking greenwashing is more flagrant than it really is. Maligning our industry in this way, has the potential to invite regulation and stifle innovation, as well as create other negative implications for our environment. To appreciate what all is at stake here, remember the consumer sector represents 2/3rds of our national economy. Rather than undermining an important tool such as green marketing, let’s put the energy expended by this report and those prone to eagerly publicize it, to positive effect. Let’s work together to: fill in the gaps about what businesses can do to improve internally, perfect life cycle assessment and multi-attribute labeling schemes, certify industry professionals, work positively with FTC, NAD and other bodies to create and enforce comprehensive green marketing guidelines and, importantly celebrate their successes. Only by doing these things can we help green marketing live up to its promise of voluntarily shifting the marketplace to greener goods and services. This article was originally published by Sustainable Life Media. 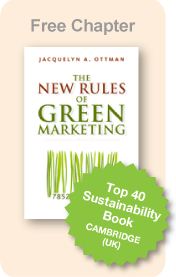 Jacquie Ottman is an adviser to Fortune 500 companies and the U.S. government on green marketing issues and strategy. She is the author of four books on green marketing, including the soon to be released, The New Rules of Green Marketing. The founder and principal of the NYC-based J. Ottman Consulting, Inc., she blogs at Jacquie Ottman’s Green Marketing Blog.